The programmable continuous slide stainer TST 44 with up to 12 parallel operating staining programs is an "assembly-line worker" for routine staining protocols frequently needed in histology and cytology laboratories. Its unique Reagent Management System (RMS) ensures high quality samples and helps reducing consumption and costs. 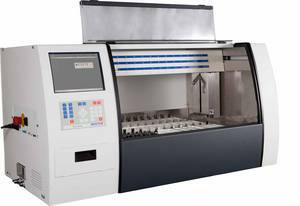 The outstanding features of the TST 44 result in a high capacity of up to 500 slides per hour and considerably decrease the time needed for this routine work in the laboratory. It's increased number of reagent stations in combination with a continous, lean working principle provides a high throughput. Up to 12 baskets with 30 slides each can be processed at the same time following identical or different staining protocols. There are four loading and four unloading stations available as start and exit baths providing fully automatic performance of the staining procedures without the need to interfere. The slide stainer can store up to 20 staining protocols with up tp 40 program steps. Up to 12 parallel operating programs can be run simultaneously. The extraction device with integrated charcoal filter and connection to an external ventilation system avoids the emission of solvent fumes and provides an optimum protection of the user's health. The water saving feature is a contribution to energy saving and environment protection. The large display facilitates programming, application and supervision of all procedures. All relevant data for the current process are listed in the plot line. By pressing the status key and choosing a basket, the whole staining program appears on the screen. Consequently the user can easily check the status of the staining procedures at a glance. The easy to follow user's guide enables efficient programming of the procedures and offers simple access to archived data. The soft running transport head with the patented drip tray uses fast X, Y and Z robotics. 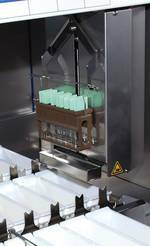 Liquid residues on the slides and the basket cannot contaminate the reagents as the small tray glides automatically under the basket as soon as it is lifted from the bath and before it is transported to the next station. A filter card in the tray absorbs the liquids thus preventing an overflowing of the tray. drain time 0 to 9 sec.